Pope Francis had a virtual papal audience with Catholics in three U.S. cities Monday and surprised a teenage girl in Chicago with a request that she sing for him. The pope, who is arriving in the U.S. in September, spoke from the Vatican via satellite in an event orchestrated by ABC News. ABC called it a "televised virtual audience with Americans." The network organized the event in secret and announced it shortly after the taping concluded. Portions of the event will be aired in a one-hour special, "Pope Francis and the People," on Friday night. Scenes from the visit were aired Monday on "World News Tonight" as delighted audiences in Chicago, Los Angeles and McAllen, Texas, applauded the pope's appearance on large monitors. One of his conversations was with a Chicago girl identified only as Valerie. The 17-year-old girl tearfully told the pope she had endured a skin disorder and had taken to singing to cope with bullying. The pope, who had been speaking in Spanish, surprised Valerie with a request in English. "I would like to hear you singing. May I ask of you to sing a song for me," he said. When Valerie looked unsure, the pope encouraged her with the words, "Be courageous." Valerie gathered herself and sang a sweet tune in Spanish and when she finished, Pope Francis said, "Thank you very much. It was very kind of you." The ABC affiliate in Chicago, WLS, spoke with the teenager after and identified her as Valerie Herrera. She said the song she sang was "By You, Mary," something she had learned in choir. The pope told his American audience, "I'm praying for all of you, the people of the United States. And I ask you to pray for me." 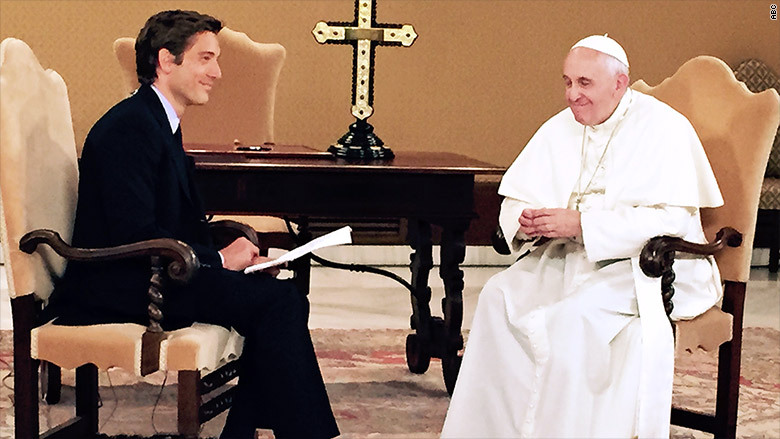 ABC's "World News Tonight" anchor David Muir met the pope -- they walked together through the garden at Casa Santa Marta, the pope's residence -- and hosted the television taping, with Muir addressing the pope in Spanish. A Vatican spokesman said it was not an interview. Instead, it was an opportunity for the pope to hear from Americans from areas of the country that will not be part of the papal visit. The ABC event is the most extensive access any American news outlet has had to the Vatican since Pope Francis became its leader. ABC News President James Goldston traveled with Muir to the Vatican for the taping. "Pope Francis heard the stories of the people while delivering his message" to them via satellite, the network said in a press release. He has not given any official interviews to American news outlets. Earlier this year a number of the media industry's top figures said the pope is their most sought after interviewee. He has also spoken with interviewers from newspapers and magazines. Participants included students from Chicago's Cristo Rey Jesuit High School, which strives to help low-income youth. The audience also included men and women from homeless shelters in Los Angeles. Pope Francis has put a strong emphasis on addressing issues of global poverty. One of the locations also reflected the Catholic Church's importance in Hispanic communities. The pews of McAllen's Sacred Heart Catholic Church was filled with participants, including immigrants from Mexico. A live picture of the pope was displayed on a screen above the church altar. ABC had correspondents in each of the cities. The complete taping of the event will be streamed in English and Spanish on ABC's web site after the special on Friday night. In some ways the event was similar to the pope's participation in two Google Hangouts, one in September 2014 and another in February 2015. Eric Marrapodi contributed reporting from Washington.